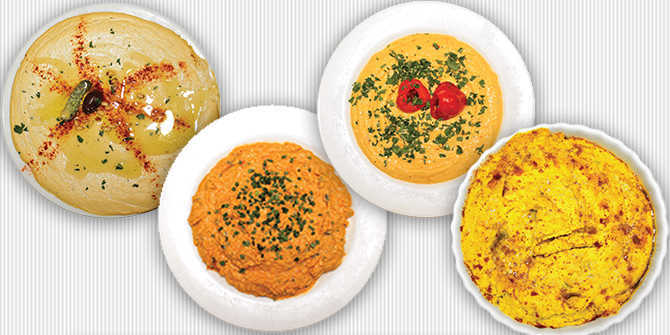 Diners expect to see hummus as a staple on the menu at any of Wichita’s many Mediterranean restaurants. But at the movie theater? While watching a hockey game at INTRUST Bank Arena? At a bar? At restaurants serving American food? Menus of non-Mediterranean restaurants across the city prove it is no joke. The menu at The Hill Bar & Grill includes Andrea’s exotic black bean and chickpea dip served with fresh vegetables and tortilla chips, Sabor Latin Bar & Grill serves roasted poblano cilantro hummus and Public at the Brickyard has a Mediterranean plate that includes hummus, just to name a few. You can nosh on hummus while watching a movie in the Warren 21 section of the Warren East or while attending an event at INTRUST Bank Arena. SAVOR…Wichita, the culinary team at the arena, makes a roasted garlic hummus available to order in the suites, for premium level ticket-holders as well as at two concession stands on the main concourse. Hummus is typically made by blending cooked and mashed chickpeas, also called garbanzo beans, with olive oil, lemon juice, garlic, salt and tahini, a sesame seed paste. The dish is commonly served with pita bread, pita chips or vegetables for dipping, and sometimes has the option of being topped with chicken or beef. The Monarch serves a hummus made with a blend of peppadew peppers that have been brined. It’s served with warm Naan bread and veggies. The hummus is also a spread on The Monarch’s veggie sandwich. She chose to put hummus on the menu when she opened The Monarch in 2012 because it is a food she loves. Ray said she considers it a comfort food and a health food at the same time. Who has the best hummus in Wichita? It’s been said that a diner could eat hummus for 30 days straight in Wichita without duplicating a restaurant. As far as we know, nobody has tried that but a local blogger did undertake a gut-busting experiment to rank the best hummus dishes in town. Eddy is the 30-something professional behind the blog Wichita By E.B. He prefers to not share his last name in an attempt to remain anonymous. Since 2011, he has reviewed more than 300 Wichita restaurants and attractions. In 2015, he decided to finally settle the question he and others had asked for years: who has the best hummus in Wichita? Rather than trying every dish in town, he solicited input from blog followers and narrowed his list to the 15 most popular restaurants for hummus. All but three were restaurants devoted to Mediterranean or Indian cuisine. “Yes, there are bars that also have hummus but if someone is specifically looking for hummus they’ll likely go to a Mediterranean restaurant,” he said. He spent $160 to purchase the hummus and recruited a dozen friends for the tasting. Each friend was given a restaurant or two to pick up from and deliver to the meeting point within the hour. Eddy transferred each hummus from the container it came in to a plate that was numbered so it would be a blind test. Tasters used one type of pita chip or could use a spoon, and they each ranked their favorite six dishes. The top six dishes, in order, were: Bella Luna Café, Meddys, Kababs, Café Maurice, Byblos and M.I.F. Deli. However, Eddy said the fact that opinions were so scattered across the pool of 15 dishes that his conclusion was that everyone needs to find the hummus that best suits their own taste. His recommendation is to try them one meal at a time, however, rather then following his method. Even before the results of the blind taste test, Eddy said his favorite hummus in Wichita was Bella Luna Café. “The hummus, the food, the service – it’s all consistent and you know you’re going to have a good experience at Bella Luna,” he said. He said his east restaurant at Bradley Fair and west location at NewMarket Square together sell 12 to 16 gallons of hummus per day. It does so well that he’s had little luck with adding other appetizers to the menu. His recipe is based on what his mother and grandmother taught him, although his preparation style varies. While the ingredients in hummus are simple, he said, the quality of the raw products and the way they are cooked impact the final taste and texture of the dish. He also believes it’s important to make it fresh every day. Taha credits familiarity with the dish and its healthiness with making hummus so popular in Wichita.